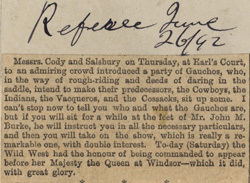 Messrs. Cody and Salsbury on Thursday, at Earl's Court, to an admiring crowd introduced a party of Gauchos, who, in the way of rough-riding and deeds of daring in the saddle, intend to make their predecessors, the Cowboys, the Indians, the Vacqueros, and the Cossacks, sit up some. I can't stop now to tell you who and what the Gauchos are, but if you will sit for a while at the feet of Mr. John M. Burke, he will instruct you in all the necessary particulars, and then you will take on the show, which is really a remarkable one, with double interest. 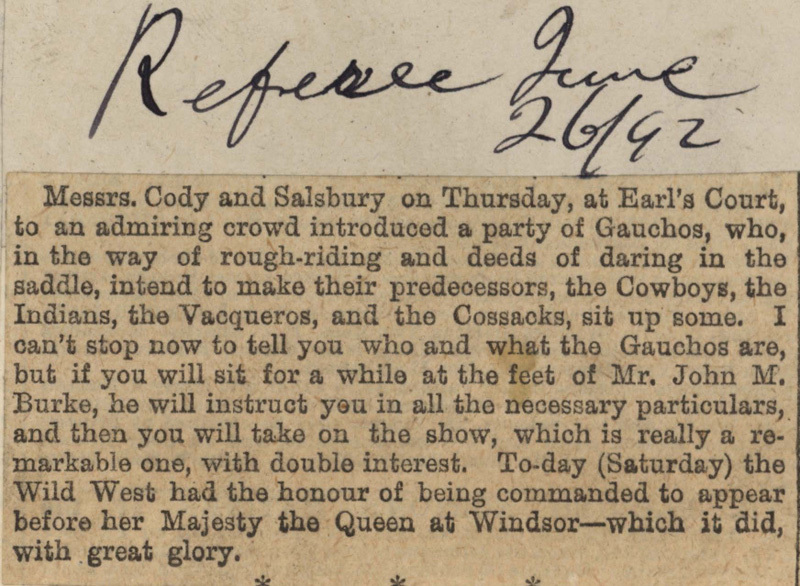 To-day (Saturday) the Wild West had the honour of being commanded to appear before her Majesty the Queen at Windsor—which it did, with great glory.